PLDT and its wireless subsidiary, Smart Communications, made sure that festivalgoers and residents got the best experience at this year’s Panagbenga Festival. The companies committed extensive support to Baguio City as it recently celebrated its annual flower festival, which drew thousands of locals and foreign visitors. 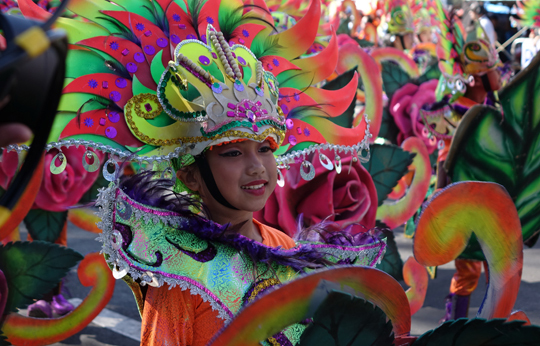 A young delegate dons a colorful costume at the Panagbenga Festival grand parade. Baguio’s Panagbenga or Flower Festival is a month-long celebration that features parade floats, street dancing, concerts, and other festivities. Blooms exude more color, music sounds livelier and the fun elevates to a higher level when shared with loved ones. PLDT and Smart made it easy for Baguio residents and tourists to connect with their family and friends through the upgraded fixed and wireless networks across Benguet province. To date, more than half of sites in Benguet already have Long-Term Evolution (LTE), while about a third of these LTE sites are already on LTE-Advanced (LTE-A). In Baguio City, 68 percent of sites are already on LTE, while about half are already on LTE-A. LTE and LTE-A are the best technologies for mobile data. Carrier aggregation, a key feature of LTE-A, allows the combination of two or more radio frequency bands in order to deliver much faster data speeds to mobile phone users. In Baguio City, 3-component carrier aggregation (3CC) has already been activated. “Our network expansion efforts in Benguet are part of our nationwide thrust to provide world-class mobile data experience to our subscribers,” said Mario G. Tamayo, PLDT-Smart senior vice president for network planning and engineering. “With our upgraded networks, residents and tourists in Baguio can stay connected with their families here and abroad, share their memorable Panagbenga experience with the rest of the world through photos and videos, and access important online services, like banking and e-commerce,” Tamayo added. As a treat to Panagbenga revelers, PLDT Home Fibr provided free Wi-Fi at the Athletic Bowl and Melvin Jones Grandstand at Burnham Park during the grand float parade, enabling them to share online their festival experiences in real-time. Smart also put up a hub along Upper Session Road. At the Smart Hub, visitors can hang out, charge their phones, take photos, get premium items, and prepare their festival itinerary. Festivalgoers planning their trips ahead were also able to download the Baguio Guide app, a collaboration by the city government, the Department of Tourism, Smart, and InnoPub Media. The app features information on must-try food and must-visit places in Baguio, as well as DOT-accredited tour guides and tour operators. It also has a directory of important contact numbers of hospitals, emergency units, and police stations. The Smart Hub also gave visitors a chance to #ExplorePanagbenga by helping them plot their tours through QR codes that contain details on the best destinations in the city. Visitors also enjoyed their time at the hub by playing augmented reality games, and got limited edition souvenir items and photo printouts. Those who availed of a Smart LTE SIM with a Giga 299 data pack got the opportunity to design their own festival souvenir item, which they can take home for free. Smart also lined up a series of activities to heighten the Panagbenga Festival experience. A Smart event on Session Road featured live acts, exciting booths, and fun activities. A weekend party at The Camp featured the country’s top DJs and artists. For the best Panagbenga experience, Smart subscribers were encouraged to upgrade their 3G SIMs to LTE and avail themselves of Giga data promos. Smart’s Giga99 with Video Every Day is valid for 7 days and allows users to enjoy 2 GB worth of data plus 1 GB per day for YouTube, iflix, iWant, NBA League Pass, and Cignal Play. They can simply dial *121# to register. Mobile users were also able to capture their #SmartPanagbenga moments through the Leica triple camera of the Huawei Mate 20 Pro, which they availed of through Smart Postpaid plans. As Baguio City honors its traditions and continues to keep its culture alive through the Panagbenga Festival, PLDT and Smart aim to contribute to such efforts by providing the best wired and mobile communication services in all parts of the Philippines.